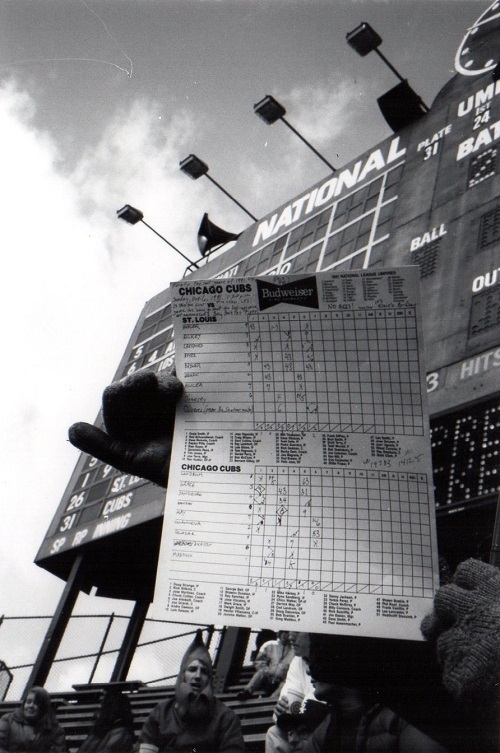 A photograph of a scorecard, mid-game, game time 1:20 p.m., Sunday, Oct.6, 1991. OUTFLD GEN ADM 6.00. Finally. The last game of 1991. St. Louis 7, Cubs 3. Sweep. 17,169. NO BEES! It’s Elsie’s B-Day. VIC, COTE, & ME. Sandberg hits his 100th RBI. As summer sizzles and drizzles and pops all around me, I dig into hundreds of miles away and years ago and again it’s right here, again. I wanted to see the last scorecard I kept and I was sure it was from the last game I went to, a dozen years ago, 2004, on or around my birthday, and it should be right there, at the end of it all, all the cards in their plastic crate in their file folders, organized by year, but it is not. 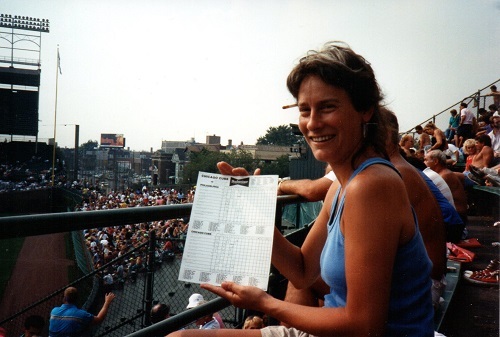 Rather, the last scorecard is from Friday, August 10, 2001, the Cubs beating the Giants 9-3, starting time 2:20 p.m., 77 degrees, clear, wind blowing in. Lieber pitched a complete game. I sat in a Club Box, Section 36, Row 3, a $30 ticket—now how did that happen? And how can it be that this is the last scorecard? I can picture that 2004 game, a night game, box seats between home and third, a lovely night, but, no scorecard? And nothing from 2003? 2002? Perhaps I should stop here, but I delve in. And now I must pause to acknowledge: fear. I am exploring this notion, perhaps harsh old lesson, that “You Can’t Go Home Again,” which is the title of a book by Thomas Wolfe. I have never read it, but it’s about time I did, so I’ve checked it out of the library. At any rate, that is how it seemed to young George Webber, who was never so assured of his purpose as when he was going somewhere on a train. And he never had the sense of home so much as when he felt that he was going there. It was only when he got there that his homelessness began. 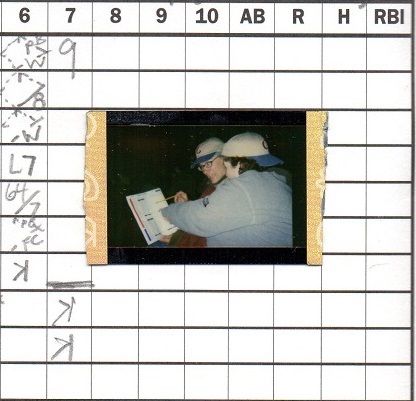 I am on a train, tunneling into scorecards, not sure where I am going, but enjoying the scenery, like this scorecard with a photo, May 22, 2001, a night game against the Reds, Cubs win, 5-3, there is a rain delay in the fifth inning, my scoring stops after the seventh, and there is the photo glued to the squares for the eighth, ninth, and tenth innings, it is NU Night—Northwestern University—at Wrigley Field, so I am with co-workers in Sec. 208, Row 16. I still have that cap. Must have been a give-away. And there’s Ami. She was fun. Then there is this game from 1994. The Braves beat the Cubs, 19-5. I sat in the bleachers, it’s a 2:20 p.m. Friday game, April 15. I’ve just come from the dentist where I took gas, headphones & a filling. The wind howls from home to scoreboard. How will I get home riding against it? 53 degrees. Atlanta hit three home runs in the first inning off Anthony Young and after the fourth inning my scorekeeping stops and there is this note: 2 hours, 4 innings, 11 Atlanta runs, 10 (at least) less degrees later—I’m going home! Riding home against wind gusts up to 40 MPH. I saved the newspaper articles, Tribune and Sun-Times, and they are pretty funny. Cubs manager Tom Trebelhorn is described as “shell-shocked” by one paper and “surprisingly subdued” by the other. Atlanta not only had 19 runs but 24 hits and they stranded eight. Then, a Sunday afternoon game, May 5, 1996. In the bottom of the ninth Sammy Sosa hits a home run that breaks a window in an apartment building on Waveland Avenue. Cubs win, 5-4, beating the Mets. Game time temp 49 degrees with a crowd of 25,949. I was in Aisle 240, Row 8, Seat 7. But mostly I sat here. 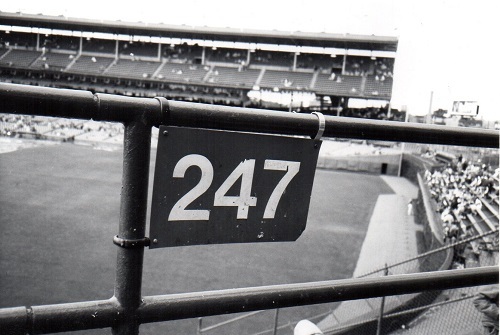 And then all the memories of all the Opening Days, a long string of which began in the late 1970s with an impromptu drive from Appleton, Wisconsin, with a guy named Rick, and eventually years later the finagling it took to get Opening Day tickets and other dates as well—I’m talking bleachers, here—and remembering how in February I would pore over the Cubs schedule, confer with my then-husband and friends and relatives, construct a list of games to attend, number of tickets to get, and then on the day tickets went on sale figuring out the best TicketMaster outlet to go to, how early to get there, the route to take, and then the cold and coffee and camaraderie and cigarettes of standing in line at dawn, late February, maybe March, to get tickets for the heat of August, the method and structure of ticket sales always changing, I see that now, and it jostles away this old static memory that bleacher tickets were sold at the gate, day of game only, that of course going way back to ’84 when what you could do is, one or two people go early, stand in line on Sheffield or Waveland and then when the gates open buy your ticket but also tickets for those who come later, closer to game time, and then those who come later stand out on Sheffield, wait for someone to appear above, the someone who’s inside the park with tickets saving front row center field seats, and then that someone tosses a slightly scrunched-up paper cup up and over the chain link fence that tops the story-high brick wall along the back of the bleachers, and down the cup falls into your hands or at your feet and inside the cup is your ticket, maybe just slightly dampened by a dredge of beer. How we coordinated that without cell phones or smart phones, I don’t know, but that’s what I remember, until I delve into these years of scorecards and notes and changes and see yes, things were always changing, one frame to the next, static moments in memory only. My 1984 file is thickest by far—40 scorecards. For a few years, goofy predictions were made on Opening Day, and I had forgotten about that, but I find these predictions now and my favorite is by Ann, then my sister-in-law, Opening Day 1994, that auspicious start to a season with three consecutive home runs by the Cubs’ lead-off hitter, Karl “Tuffy” Rhodes, the homers coming off Dwight Gooden in the first, third, and fifth innings, all to left field, but the Cubs, nonetheless, losing to the Mets, 12-8, on a 65-degree April 4 day, wind blowing out vigorously, and Ann is predicting that Tonya Harding will throw out the first ball Opening Day 1995. Perhaps it is relevant, as on that scorecard, kept in the bleachers, front row, center field, I make two notes—“HILLARY CLINTON!” “BONNIE BLAIR!”—and I am guessing that day these two women threw out ceremonial first pitches. Interesting. Dallas Green was managing the Mets. And now here comes a curve, a curve ball, context. The last scorecard of 1994 is noted Aug 10 – Wed – 1:20 – with Dad – Last game before strike date, 65 degrees + Rain – 34,984. The Cubs lost to San Francisco, 5-2. My dad and I were in Aisle 202, Row 2, and I had Seat 4. I have a static memory of standing for the seventh inning stretch, holding an umbrella, singing “Take Me Out to the Ballgame” with close to 35,000 others, belting it out, kind of an opening of every pore to take it all in because there was this strike looming, we all knew it, and the strike happened and so baseball was over for that year, there was no World Series, and I got mad at baseball but I also learned Oh, I see, I can live without baseball, and somewhere in there, before that, there was a miscarriage, and I remember I was at the ballpark when I first felt those pains, and later then I stopped drinking, stopped smoking, stopped drinking coffee, and so habits changed and life went on, and I’m not sure how any of this is related or even important but it pops into mind; then in 1995 all the pets in the household changed, and then maybe it was ’96 that I changed jobs, began working full-time, and in ’97 there was the move from the city to the suburb so no more bike rides to Wrigley Field, now a train ride, and really no big deal but it got harder and harder to get to a game, even with all the night games, but maybe also because of all the night games because night games were something I never really got used to, and I had stopped sitting in the bleachers because people move, move on, or maybe not, but it changes, and you change, and I remember how irritating it was when people began bringing phones to the game, to the bleachers, people talking on their phones in the middle of a ballgame!, it seemed so odd and stupid and was just so easy to mock but also, it was a trend, so soon more and more of this, less and less of that, and for better or worse, things change. That ain’t me, babe. Or no, wait minute, is it? I carry this image in my head of my dad and me at Wrigley Field in an upper deck box between home and first on a somewhat cold, rainy day. I see him in one of his driving caps rather than a Cubs cap, and for a raincoat I am wearing a brown plastic trash bag. We both wear gloves, keep score, are part of a sparse crowd, don’t say much, and when the game is over we take the el home, or he takes the el home and I get on my bike. This image comes to mind whenever I think of how one should never leave a game until the last out is played or the last run is scored. I am not sure why this image has become memorable, become static, but I am wondering now if I can find my scorecard for that game and match it up against my dad’s, for I have all of his scorecards, too. Maybe that game was April 29, 1995, Aisle 431, Row 4, Seat 4, ticket: $7.50. A Saturday afternoon. Opening Day + 1 … GREY, 49 degrees … 28, 244. I make a note that the umpires are not regular umpires but “replacement umpires,” and that, as well as this late start to the 1995 season, speaks to the duration and acrimony of the strike. But, nonetheless, that day the Cubs beat Montreal, 5-4. Dunston had a three-run homer in the first; Sosa hit a single shot in the sixth. In the top of the ninth Montreal threatened, scoring a run on two outs, an RBI double by Shane Andrews who was then left stranded on second, the last out being a fly ball to right, and I wonder now how close to the warning track, to the ivy, to the brick, that last out flew. 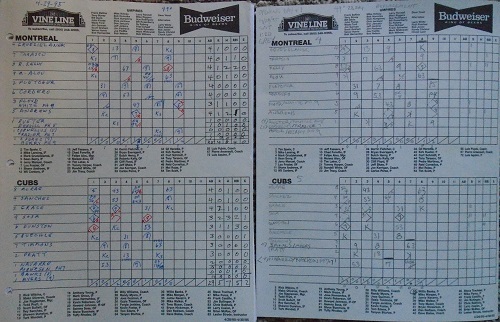 Father-daughter scorecards, April 29, 1995. I know now I didn’t keep a scorecard for that game in 2004, and I wonder if all these years later, these years of breaking down and messing up and rebuilding, carrying on, if I were to show up at Wrigley's gate, would it be like old friends hugging away the years, embracing the struggles, the changes? Or would it be like wary strangers eyeing each other, judging the changes, a tsk tsk and a fare-thee-well. Either way, for sure, this time I’m keeping a scorecard. 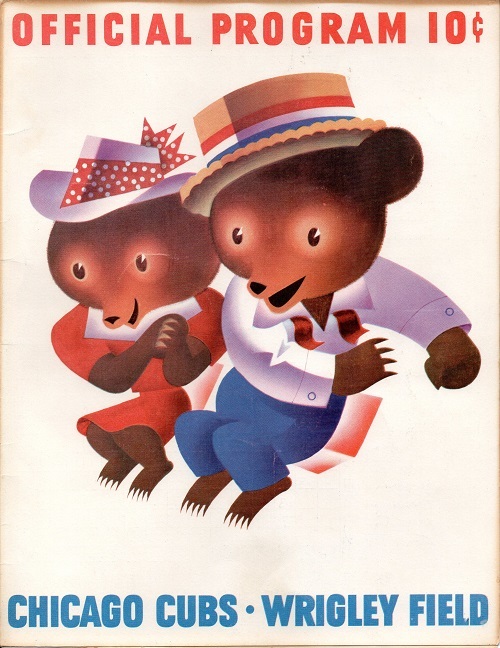 Circa 1961, the heyday of scorecard cover art. No, I wasn’t at the game, but somebody was, and they kept score through the sixth inning. The Milwaukee Braves were in town. Ernie Banks was at short, Santo at third, Williams in left, and some guy named Zimmer played second. A bleacher seat cost 75 cents, tax included, and you could get a taffy apple for 15 cents, a cigar for 10 cents, a pencil for 5 cents, and, best of all, you could rent a seat cushion: 10 cents.